curry can be a vegan’s best friend, especially if you get it from a restaurant where the staff is knowledgeable and straight up about ingredients. fortunately for us herbivores who live west of vermont (sorry, ¡yo soy! ), the owners of the vegan-friendly hipster hangout electric lotus also have another fine, less trendy indian restaurant on san vicente: india’s grill. the service at india’s grill is impeccable, the interior is lovely, and most importantly, the food is delicious. we often get our curry to go, however, because india’s grill is on the way home from my husband’s work. plus, i like to eat dinner and watch twin peaks at the same time. because the portions from india’s grill are pretty huge, i usually end up with leftovers. hence takeaway breakfast curry. i assure you, it’s just as good the second time around. i think curry for breakfast is underrated. it’s great to wake up with tons of flavor and food that sets your mouth on fire. gets you ready for the day, i tell ya! 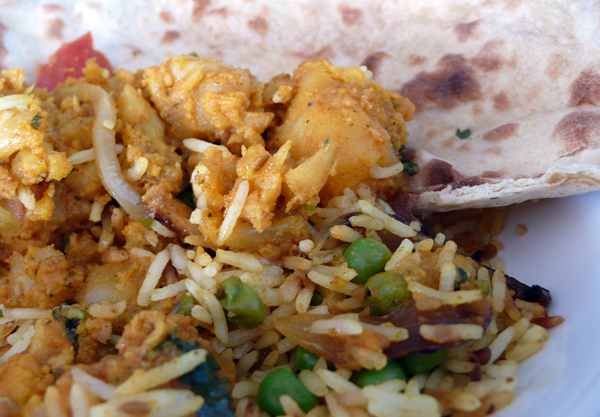 while india’s grill specializes in several vegetarian dishes that can be made vegan, aloo gobhi is my favorite. potatoes in cauliflower in a light sauce blended together with the perfect spices. i always ask them to make it extra hot, because most curry dishes are too mild for me otherwise. this dish goes perfect with the pulao rice: saffron, grean peas and onions all sauteed together. and don’t forget to wrap everything up with a big piece of roti to make a scrumptious curry burrito. 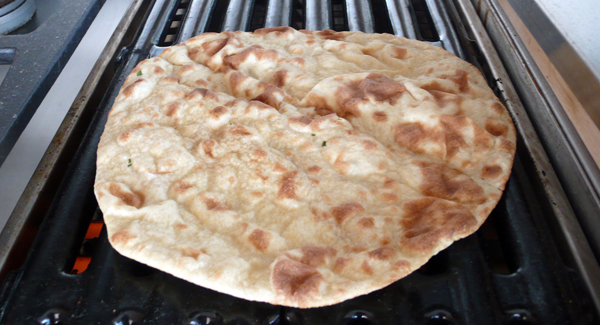 i’m pretty sure the naan contains eggs, but the roti is a-ok. just a minute on the grill, and the roti will be as good as new, even on the following day. so if you want an indian feast near weho or beverly hills, be sure to give india’s grill a shot. dine-in or take-out, they always rock my world. Nice. 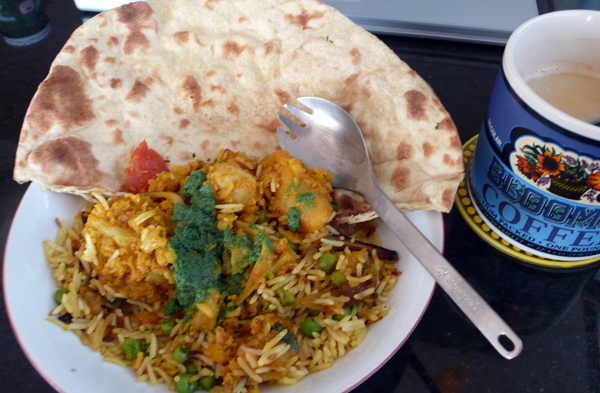 I could really go for some take away breakfast curry right now. Haha we can have an EoV/WoV showdown! I had always heard that Electric Lotus also owned Electric Karma on 3rd street–is that true or is that just one of my idiot friends thinking because they both have the name Electric in it they must be related? I had no clue they had anything to do with India Grill though but it makes sense because both places are sooooooo gooooooood. what a great looking breakfast! liz – i don’t know if they are owned by the same people! hmmm. and yeah, i will have a east west throw down any time you want! trina and lisa – you don’t know what you’re missin’. It wasn’t until I lived in Vietnam that I realized breakfast didn’t have to consist of eggs, sweet cereal, bacon, etc. I hadn’t eaten breakfast for years as I didn’t like breakfast food here. Now, my breakfast meal could be interchanged with lunch or dinner. This Indian breaky looks lovely; I think I’ll make a batch of Indian food and eat it for breakfast for a few mornings. Yum! I like your site and have bookmarked it. Thanks.